I’m a total packrat, a lifestyle that I inherited from my mother. As much as I chide her for keeping old papers and magazines around the house (just TRY to throw out a damn National Geographic down there, man), the apple doesn’t fall too far from the tree. My problem is, I can see the artistic potential in freaking EVERYTHING and I hate letting something interesting just go to waste. Old comics with the covers tore off and gnawed up corners still have these insane ads in them that could totally go on a t-shirt one day, and if someone writes me a love letter or a christmas card, I can’t bring myself to just wad that sentiment up and throw it on top of some old coffee grounds. 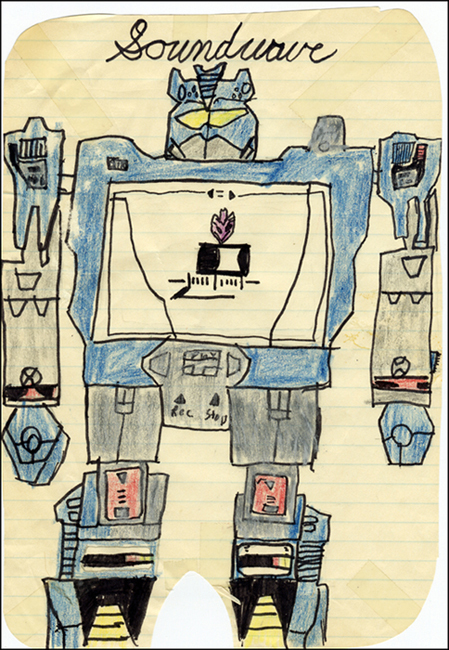 When I was visiting my folks a few weeks ago, I found some old drawings of Transformers I did in 5th grade. Touching them made me come unstuck in time, and I swung instantly back to my childhood bedroom in Herndon. 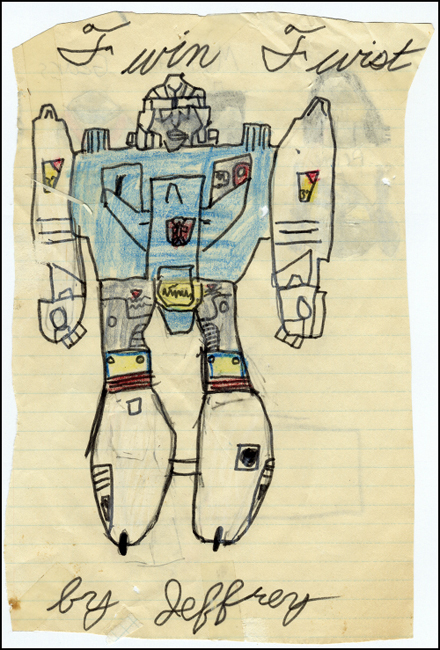 I was sitting at that desk my Dad built for me one snowy afternoon, drawing the Transformers and listening to the Saint Elmo’s Fire soundtrack on cassette. Look, it was my first tape. 3) It’s the purest example of a sheerly commercial film that has ever existed. Seriously. This is a movie based on a cartoon that was developed to market a line of toys that had been popular in Japan to American children. There’s no originality or artistic integrity to squander here, no mythos or greater canon to honor — it’s just gonna be flames and explosions and giant hunks of metal left right and center. It’s going to be the cinematic equivalent of smoking banana peels and I can’t wait.